Just wondering if anyone has pics of the upper most part of Milk Creek Valley. I would like to see about planning a route, if possible, over to Deception Basin. I am not at all sure this is possible safely for a backpacker who is NOT a climber. If anyone has done this, is it possible to get some GRAPHIC route info...I am a very visual guy and it is hard for me to understand it if it is just verbal. Thank you for your help. I'll see if I can upload some photos and send you PM. 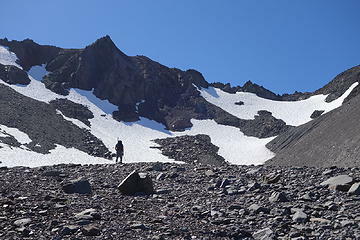 I'm not really a climber and I've come down it from Fricaba several times as part of a loop day hike (Upper Dungy-Royal basin-Deception basin-Fricaba-Milk Creek drainage-cross the Dungy and then exit via Heather Creek/Upper Dungy trail). There are a few spots that are very, very steep that could be challenging to go over w/ hard snow pack as I recall. Milk Creek basin has been on my list of places to go for years now, but I still haven't made it over there yet. But it looks very wild and remote. You probably already have pictures of this part of the basin, but I've included them just in case they might be helpful. 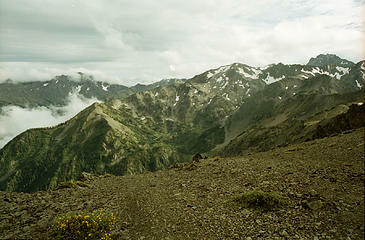 I've looked at potential routes into Milk Creek while hiking into Deception Basin. Last time that I was in the Southeast corner of upper Royal Basin (directly west of the ridge that divides upper Royal Basin from upper Milk Creek basin), I was looking at potential routes into Milk Creek. The ridge looked pretty steep but there were some potential animal trails leading over it, and it looked like you could reach the top of it with some basic scrambling. I don't know how the descent on the other side would be, but the Topo maps seem to indicate about the same steepness on the Milk Creek side. Here are a couple of pictures showing the terrain and the ridge dividing the upper portion of Milk Creek Basin from upper most part of Royal Basin. And finally a photo taken from the (nearly) 7000ft peak just east of Snifter Spire on the ridge dividing Royal Basin from Deception. 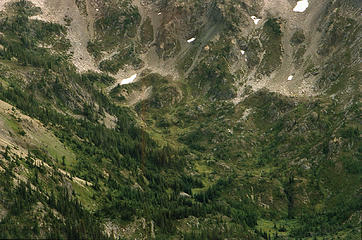 Looking east toward upper Milk Creek basin and Fricaba (just outside of the photo on the right side). This gives some idea of the kind of terrain in that area. 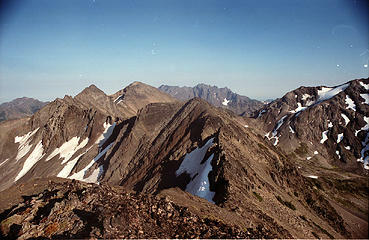 View looking east toward Fricaba from the (nearly) 7000ft 'peak' a little East of Snifter Spire on the divide between Royal Basin and Deception Basin. Anyway, hopefully meck or someone else on the board can provide you with better pics and some solid route info, but I'm posting these photos in the hope that they might be of some help to you in the mean time. Thanks for the GREAT pics. It really helps me to try to make this a great and safer route. I know there will be many challenges to find a way through here and I want to do it in a safe manner. 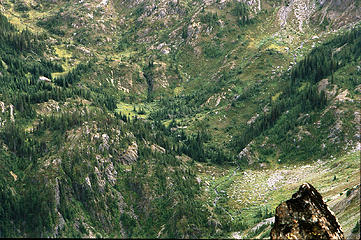 One of my concerns is crossing the ridge on the North side of Deception Basin toward Royal Basin. Has anyone done it? If so, where? 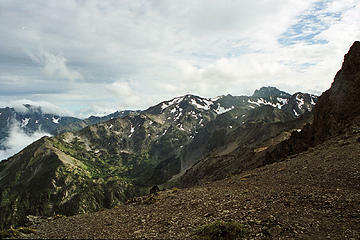 There should be a pretty obvious scree path up out of Deception Basin to the low pass just east of Mt Deception, that then drops into Royal Basin (I've gone up over this north->south twice over to Fricabe, and south to north once from climbing Hal Foss). The scree could be tedious (three steps forward, 1-2 steps back). The Royal Basin side is very steep towards the top of the pass, and depending on snow conditions, could be quite dangerous. The exposed shale slopes in mid summer allowed me to stay slightly east of the pass on the Royal Basin side above the hard snow mini bowl on two occasions, but another time I went over it the snow was quite soft and I was able to boot-up the bowl (even the steep section approaching the top). 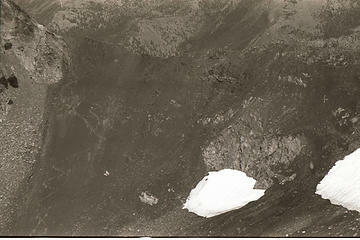 One of my concerns is crossing the ridge on the North side of Deception Basin toward Royal Basin. Has anyone done it? If so, where? Deception Basin to Royal Basin is pretty doable. There are several saddles to choose from - we crossed the 6800'+ saddle NW of Mt. Fricaba (the one just to the left of '6600' on the USGS map). There's some permanent snow on the N side of that saddle that's kind of steep. I believe we used ice axes for a few hundred feet. 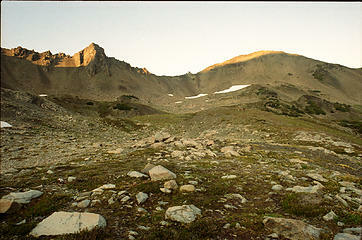 The S side is straightforward scree sidehilling and following faint animal/boot paths into Deception Basin. On the way back we used a different saddle closer to Mt. Deception and it was a lot steeper and more tedious. 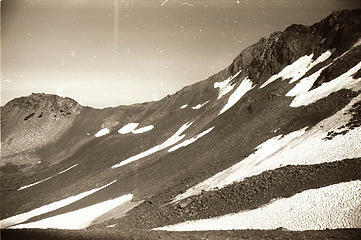 The N side of the saddle in September. 6800'+ saddle is on the right side of the photo. Thank you Jake. I appreciate the info and pic.